I’ve mentioned before that this is our first cruise during which we have been on Freedom dining. This part of the post is to report our experience of this, which is: very successful. So far we’ve had three Freedom Dining meals (the other three have been in the Select Dining restaurants). Each time we’ve gone to the dining room at about 7:30, and been seated immediately. Every time we’ve been asked if we would share a table; we’ve always replied ‘yes’; and we’ve been lead to a table straightaway. Once we were the last couple on a table, and last night we were the first couple on an 8-seat table. If last night was anything to go by, the tables fill up within a few minutes (certainly at that time) so there hasn’t been a situation where different people on the table have been at different stages of their meal. Perhaps we’ve been lucky, but we’ve had good company. Indeed, in some respects the Freedom Dining concept means that you relax a bit more; you know that the people you’re dining with are for tonight only, so you don’t stress about any little habits you might observe, and you pick up quickly on the points you can respond to. We’ve had three really good meals, and have finished between 9 o’clock and 9:30. We’re converts. Today we’ve been at Villefranche, for the first time. What a delight! – a lovely little Mediterranean town with the hills at the back. 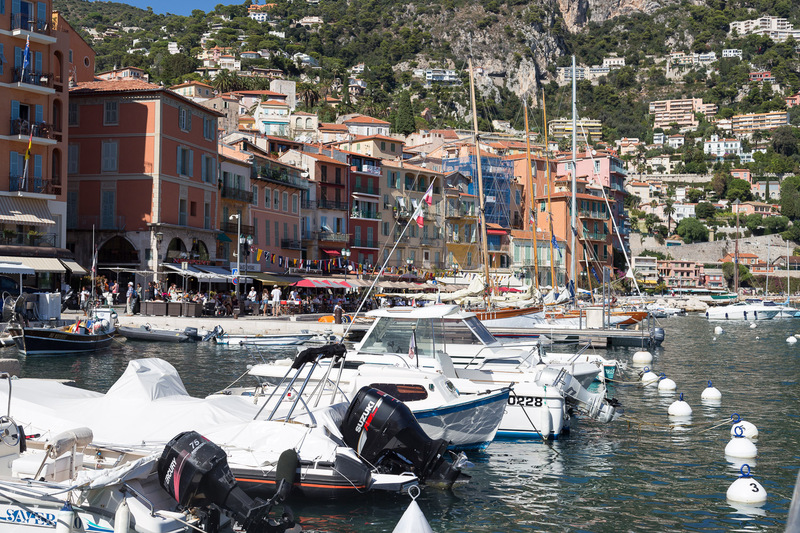 We were going to be ambitious and get the bus into Nice and then work our way back, but in the event we just stayed in Villefranche. We walked along the front and had a coffee at the Anjuna Cafe;; then we walked back and explored the fortress; then we went further into the ‘new harbour’, found a very French harbour-side cafe and had some sparkling water; and then we returned to the old town, found a restaurant and had lunch and a smashing half-litre bottle of wine. Yes, a half-litre bottle; I haven’t seen that before, but it was just the right size. After lunch we explored the higher levels of the old town a bit more before finding a bar for another drink. Then we came back to the ship. The weather has been beautiful – temperature around 27º, and clear blue skies. This has been the best port of call so far on this cruise by a long way. Just a few words about tendering. Tickets were available from 8 o’clock in the Meridian restaurant, and they did ask passengers to only go for tickets when they were ready to disembark. We got there at about 9 o’clock, which was forecast to be the beginning of the busy period. In the event we waited in the restaurant for about 35 minutes before our ticket numbers were called and we went down to the pontoons on deck 4. We were among the first onto the tender which took perhaps 10 minutes to fill completely. The actually trip into the harbour took a bit less than 10 minutes. Then there was a bit of a holdup; Pullmantur’s ‘Sovereign’ was also in port today, and the combination of tenders from two ships plus local boat movements meant that we were waiting just off the harbour entrance for about 10 or 15 minutes before we could get to the berth. So in the end it was after 10 before we stepped ashore. Without the delay it would have been just under an hour from collecting our ticket to stepping ashore. Coming back not only did they have several of Azura’s tenders in operation, they also had a couple of local boats doing the run, and in fact we got one of these. Very pleasant, sitting on an open rear deck on the way back. I enjoy reading your blog. Thanks. We’ve done freedom dining on all our cruises so far and are as you describe but have never had people eating at different stages of their meals. Everyone arrives at more or less the same time.